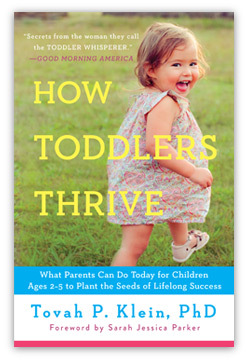 Dr. Tovah Klein’s research and firsthand work with thousands of toddlers explains why the toddler brain makes their behavior so turbulent, and why your reaction to their behavior—the way you speak to, speak about, and act toward your toddler—holds the key to laying the foundation for life-long success. Dr. Klein reveals the new science behind developing crucial lifelong skills such as resilience, self-reliance, self-regulation, and empathy that are more critical to success than simple intelligence. 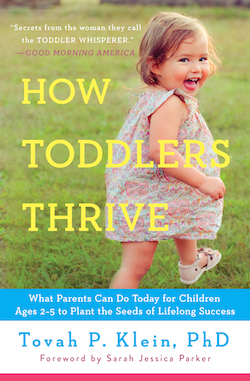 How Toddlers Thrive helps parents to troubleshoot the day-to-day struggles (like getting out the door, mealtime, bedtime, tantrums, defiant behavior, toilet training) and to ensure that your toddler receives the kinds of positive attention, guidance and interactions they need at this unique window in their lives.